On November 3, 1988, Abdullah Luthufi, a once-prominent Maldivian businessman, allegedly in connivance with Ibrahim Nasir, the country’s former president, hired about 100 gunmen from the People’s Liberation Organization of Tamil Eelam – one of several secessionist Tamil groups fighting for a separate homeland in Sri Lanka during that time – and led them to overthrow the-then president of the country, Maumoon Abdul Gayoom. As the PLOTE mercenaries landed in the capital, Male, and gained control of the city, Gayoom managed to escape capture by moving from one house to another and sent an SOS to India to save him and his country. Rajiv Gandhi was India’s prime minister. He responded immediately and dispatched 1,600 Indian Army paratroopers on Indian Air Force IL-76 planes to the atoll nation. In nine hours, the execution of “Operation Cactus” began. After securing the Male airport in no time, the Indian troops quickly dislodged the mercenaries from government buildings and other key sites. Later, Indian Navy warships intercepted a vessel the mercenaries had hijacked to flee, rescued the hostages on it and captured the gunmen. Luthufi managed to take a boat and escape following high drama on the sea. The coup crumbled. Enabled by India’s military intervention, Gayoom regained control of his country and went on to rule it for the next 20 years. Under Gayoom, as one would expect, the Maldives – a key strategic country in the Indian Ocean Region (IOR) – remained one of India’s most trusted and dependable friends in the neighbourhood. 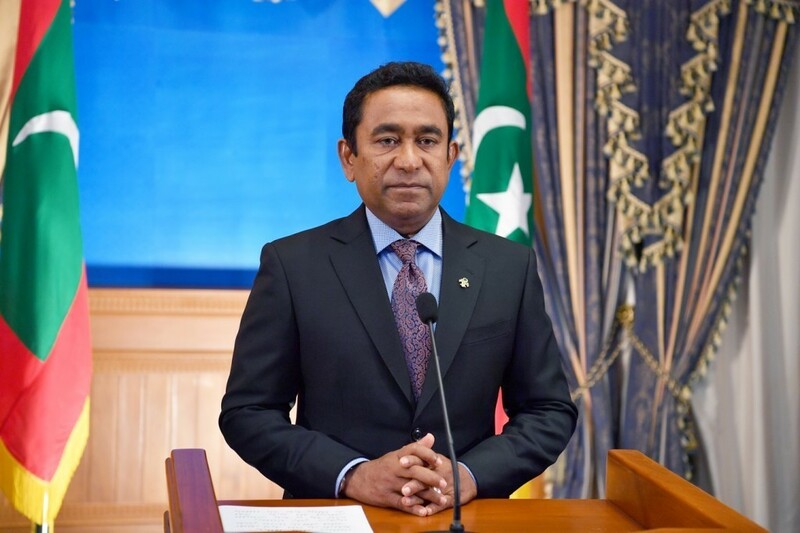 The bonhomie between New Delhi and Male continued after Gayoom when Mohamed Nasheed, the first democratically elected president of the Maldives, took office in 2008. Then a political crisis hit the country in early 2012. Nasheed was forced to resign. An interim government under a new president, Mohamed Waheed Hussain Manik, took office. The Commonwealth suspended the Maldives for “ousting” Nasheed. A new election was held in 2013. Abdulla Yameen Abdul Gayoom, who is Gayoom’s half-brother, “won” the election, marred by chaos and controversy, and bizarre allegations. India, months away from a general election, chose to watch the developments in the atoll nation from the sidelines. In February 2015, Nasheed was arrested on terrorism charges. He was tried and sentenced to 13 years in jail. (A year later, he was allowed to travel abroad for surgery. The UK granted him asylum.) Unhappy with the events in the Maldives, India’s new prime minister, Narendra Modi, cancelled a trip to Male that year much to the chagrin of the Yameen regime. It was probably then that Yameen decided to play hardball against India. He began to woo China and Pakistan – India’s biggest geostrategic rival and archenemy, respectively. This alarmed India and it began re-engaging with the Maldives. However, this did not sway Yameen to change his new China and Pakistan policies. Today, the Maldives has leased an island close to the Male airport to China for 50 years. This has raised concerns in New Delhi because of Beijing’s “String of Pearls” design to encircle India in the IOR. China already has Sri Lanka’s Hambantota port under a 99-year lease in India’s south and Pakistan’s Gwadar port in India’s west. There are also reports that there is Chinese presence in the Burmese-controlled strategic Coco Islands near the Andaman and Nicobar Islands in India’s southwest. Apart from this, India is currently witnessing a sharp rise in Chinese naval activities in the IOR. Yameen visited China in 2017, signed a dozen agreements and extended his full support to Beijing’s Maritime Silk Road initiative. The Chinese president, Xi Jinping, declared the Maldives an “important partner” of China and among its “closest friends”. Already, the Maldives’ trade with China far exceeds its trade with India. Although Pakistan has used the Maldives as an outpost for its spy agency, Inter-Services Intelligence (ISI), for years now, the pro-Pakistan and seemingly anti-India stance of the Yameen regime has given rise to concerns that the atoll nation could be the next hotspot of transnational terror organizations, which may carry out 26/11-type terror attacks against India. Already, the Maldives has witnessed rapid radicalization of its youth since Yameen came to power. There have been reports of many Maldivian youths joining jihadist groups in Syria. This radicalization is sponsored by Wahhabi funds from Saudi Arabia – a country which is investing heavily in the Maldives for its own strategic interests. There were also reports that the Maldives was going to “sell” Faafu – one of its 26 natural atolls – to Saudi Arabia. And this has alarmed India. As things stand today, the Maldives has become a potential military threat to India because of China and a potential terror threat because of Pakistan and Saudi Arabia, and Yameen is directly responsible for it. On February 2, in a surprise move, the Maldivian supreme court ruled the 2015 trial of Nasheed unconstitutional and ordered the release of nine members of the country’s parliament. This would have seen opposition majority restored. Yameen, determined not to lose power, declared emergency for 15 days calling the court ruling a “coup attempt” and ordered the arrest of the chief justice and another judge of the supreme court. Within hours of the judges’ arrest, the court took a U-turn and revoked its decision to free the jailed opposition politicians. Meanwhile, the Maldivian opposition, including the exiled Nasheed, appealed to India for help and sought New Delhi’s military intervention to restore democracy in the country, evoking the memories of Gayoom’s 1988 SOS. Nasheed even accused Yameen of acting under China’s influence. This was not without basis. Soon after Yameen declared a state of emergency, China warned India, indirectly through its foreign ministry and directly through its mouthpiece, not to interfere in the Maldives’ internal affairs. Yameen, for his part, sent envoys to China and Saudi Arabia for support. India cannot, however, sit idle and watch the Maldives slip into enemy hands permanently. India must ignore the Chinese and the Saudis for they are in no position to stop New Delhi militarily. India can brush aside the tiny and ill-equipped Maldivian military in a matter of hours. Apart from that, the west is firmly on the side of the Maldivian opposition and any action that is seen as helping them and restoring democracy in the country will be supported and appreciated at international forums. Any move at the United Nations against India will certainly be vetoed. If Yameen is not removed with force now, the hope for democracy returning to the Maldives will fade and India will have to bear with a hostile country in its strategic backyard, which can pose a terror or military threat in the coming days. The attitude Yameen has displayed so far leaves little doubt that he will go to any extent to consolidate his grip on power. This could also mean taking measures like allowing China a military base in the country to neutralize a future Indian military intervention. Such a base will pose a permanent Chinese military threat to India from the Indian Ocean. This is a perfect opportunity for New Delhi to unleash gunboat diplomacy against the Yameen regime. If India refrains and misses the chance, it will commit a strategic blunder, from which there might be no recovery. The article presented with awesome facts which we get to know historical and geopolitical facts, maritime, trade and strategic relations with our neighbouring nations. Maldives crisis worst day by day! President Yamin is more scary than a dicator. Not even close to hitler. If India refrains and misses…….. THIS CONCLUSION IS THE ABSOLUTE FACT WHICH SIR, NARENDRA MODI NEED TO THINK THRICE!!! An excellent primer on the Maldive crises. A regime change, with or without military intervention is an urgent requirement.